I fully believe that every event in the whole universe is connected to every other event in the whole universe, and while our limited human intellect cannot grasp that massive totality, on occasion, we get to see a glimpse. December 2017 I was on my way to my beloved New York City. I stepped aboard the plane, wended my way back to my assigned seat but, upon seeing the man at the end of my row, suddenly got the urge to turn in one row early. I plopped down next to the window, hoping I wouldn't be asked to leave and 2 minutes later a couple situated themselves next to me. I'm usually wary of starting conversations on long flights but my willy-nilly seat decision left me no choice but to speak up lest I be moved and asked to sit next to the heebie-geebie man. They were extremely friendly, let me know that they don't like window seats anyways and that our arrangement suited them. Big sigh. 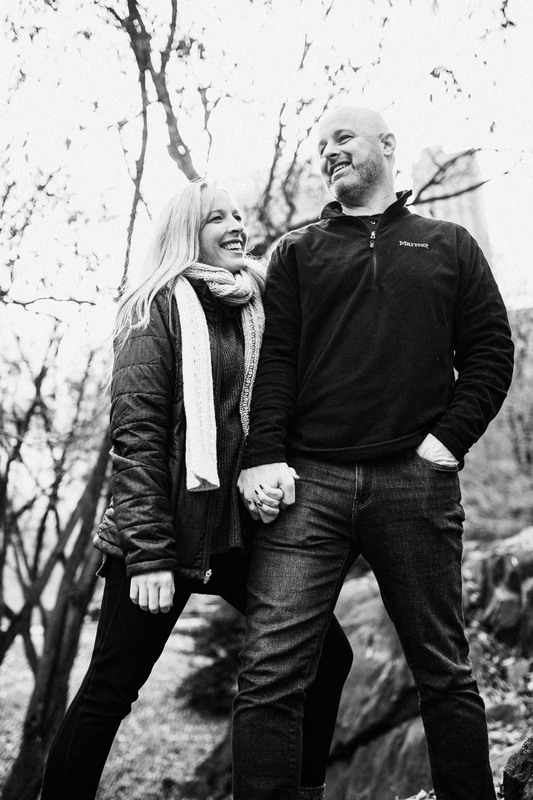 Emboldened by my luck I furthered the conversation and found out that the couple was headed to NYC for the first time to celebrate their 15th wedding anniversary. They had left their 4 babes at home for the very first time and my oozing romantic heart couldn't help but drip with love for them. All of a sudden I heard myself offering to do a quick little commemorative photoshoot with them in Central Park in two days time. WHO AM I? Nooooot the kind of person that actually does this - keep in mind I want to shoot everyone I meet, and I offer free shoots silently in my head all.of.the.time but rarely do I actually verbalize it. Well, they weren't weirded out, they actually showed up, and we actually did it. Big, big sigh. I don't get to create what I do without a subject so I'm always forever grateful to the ones that allow me to point my camera at them. Is 2019 your year for couples portraits? As a family photographer I thrive in chaos and crash and burn in stagnation. My work literally exists because of the wildness of kids spirits and I can truly only take credit for being a mere witness. As with all things in life - true greatness only comes through great challenge, and when these two rambunctious babes scurried under the sheets of mom and dads bed in their Upper East Side, New York apartment, my 'witnessing' sensors were firing on all engines and I snapped some of my favorite images to date. [Free] portraits are the thing I sometimes do. Get the low down here.